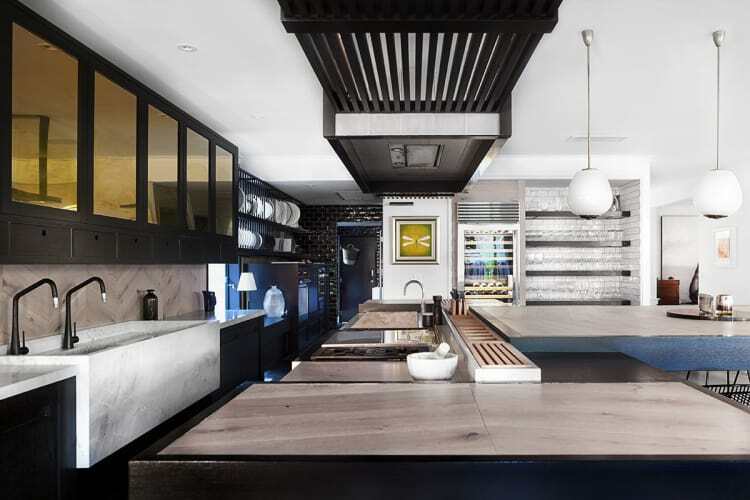 When designer Leon House describes the kitchen he designed for his own home, functionality is obviously a key element. But there’s another factor that was just as important to him – unpredictability. “I wanted an organic design with a handmade feel rather than something that looked as if it was made by a robot,” he says. And the layout, size and scale, selection of materials and references to the past all contribute to an end result that’s far from predictable. The kitchen is large, set against a wall running for 12m along the central line of the home. Much of the service side of the design – ovens, fridge, storage – is in the pantry off one end of the kitchen. This is only partially screened from the living areas, so House has added a nod to the past as a feature – a plate rack for 160 plates. This example of building the kitchen from individual pieces rather than having one highly regimented look continues in the open part of the kitchen. The central island is a case in point. At 5m long it could have over-dominated the space. But by varying heights and materials along its length and adding furniture-style feet, it has a more balanced scale and proportion. The same approach was taken for the kitchen components on the wall behind the island, where there are more references to the past. Custom made from dolomite stone, the huge kitchen sink is 1500mm long, 600mm wide and 450mm deep in the middle. Above this back benchtop is a practical arrangement of cupboards and drawers, but again with a point of difference. In between the sink bench and overhead cabinets is another unusual touch. The splashback is pre-finished timber floorboards installed in a Chevron pattern. House says the boards are ideal here, being both waterproof and hardwearing. Meanwhile, set at right angles in front of the island is an oversized table that also functions as a bar and gathering place when guests first enter this social kitchen.